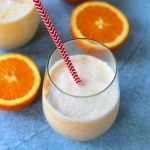 If you love the tangy, sweet taste of creamy, frosty orange smoothies that are often quite popular in mall food courts but aren’t crazy about the fact that these smoothies are typically a total sugar bomb, this lightened-up version is worth a try! 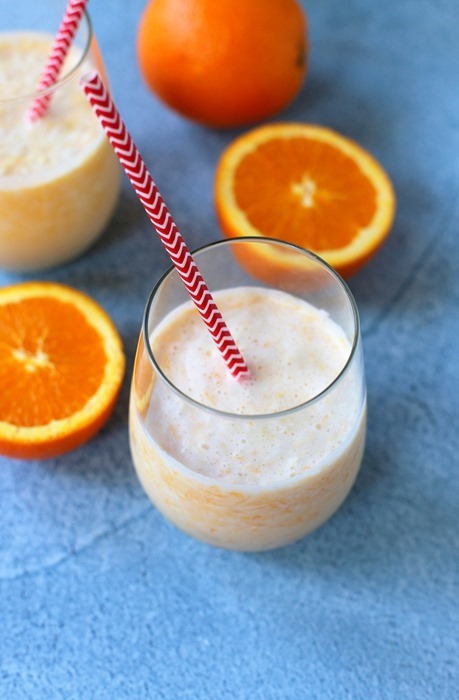 This dairy free orange smoothie is packed with fruity flavor and made with fresh orange zest, vanilla, Trop50 juice beverage ice cubes, creamy coconut milk and unsweetened vanilla almond milk. Thank you so much to Trop50 for sponsoring this post! When I think of frosty, creamy orange smoothies, I think of Christmas morning. I think of cozy flannel pajamas, digging through over-stuffed stockings and pulling off a sticky-sweet piece of monkey bread to eat. My mom always served a similar breakfast on Christmas morning when we were growing up and up until my sister and I were able to drink and mimosas took over, a sweet and frothy orange smoothie could always be found at our place at the table. I loved, no wait, LOVE orange smoothies, but not the kind you might usually make at home with bananas and other fruits. We’re talking the not-so-good for you orange smoothies you find in mall food courts. (You know, the ones that area total sugar bomb… but so ridiculously delicious!?) Since my mom’s version of these popular orange smoothies has always been synonymous with Christmas (and Easter) morning in my eyes, something about them always feels nostalgic and special. The last time I tried my hand at replicating one of these orange smoothies was on Easter morning back in April of this year. Since we stayed in Charlotte for Easter and didn’t have big plans for the day, I wanted to do something that felt a little special for our family and whipping up an at-home version of a mall food court smoothie for us to enjoy sounded like the perfect simple solution, especially since I know Ryan shares my love for the creamy citrus drink. I initially made the drink with orange juice concentrate, milk, sugar, ice and vanilla because I wasn’t feeling too creative (and that’s what Google told me to do!) but I knew in the back of my mind there had to be an easy way to revamp this classic drink and make it less of a sugar overload. I wanted to reduce the sugar in the drink but keep it tangy, flavorful and creamy. The traditional mall food court smoothies are made with up to 1/2 cup of refined sugar in them. So how was I going to get around the sugar but made sure the drink still tasted sweet? The first thought I had for naturally sweetening the smoothie was to use a frozen banana but as someone who has been making smoothies for years, I know that the minute a frozen banana is added to the mix, it totally takes over the flavor of the smoothie, so that option was out. I wanted the orange flavor to reign supreme! The first step to making my reduced-sugar orange smoothie involved swapping the orange juice concentrate base of the recipe for frozen ice cubes that I made with Trop50. Trop50 is made with real, fresh oranges and no artificial sweeteners. It has 50 percent less sugar and one 8-ounce serving is packed with a day’s worth of vitamin C and is a great source of potassium. Once I placed the Trop50 ice cubes into the blender, I added one peeled frozen orange and its zest, full-fat coconut milk (for extra creaminess) unsweetened vanilla almond milk and a splash of vanilla extract (important!) before blending everything together. 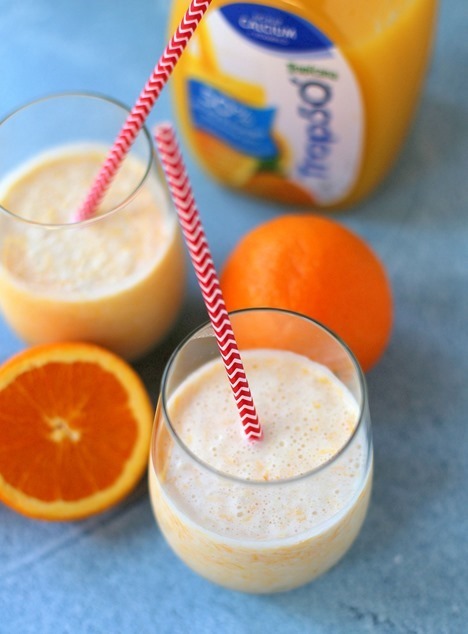 As it turns out, the sweetness from a freshly peeled orange and the Trop50 ice cubes made this dairy-free orange smoothie plenty sweet on its own… no additional sugar necessary! 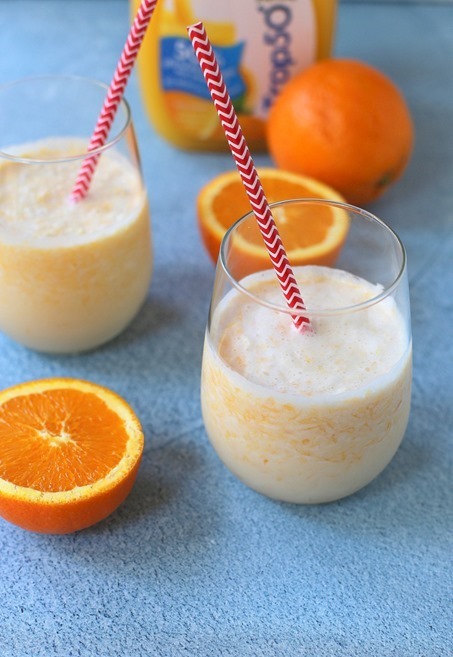 This dairy-free orange smoothie is packed with fruity flavor and made with fresh orange zest, vanilla, Trop50 ice cubes, creamy coconut milk and unsweetened vanilla almond milk. Place all ingredients into a high-powdered blender. This recipe freezes very well into popsicles. Just pour the mix into popsicle molds, freeze and enjoy for a citrusy treat! If you prefer a creamier almost milkshake-like drink, swap the almond milk for additional coconut milk. If you do not like any pulp in your smoothies, you may omit the frozen orange from the recipe but may need to slightly reduce the amount of almond milk to keep the smoothie relatively thick. Is there a certain beverage or food you associate with a favorite holiday? I’ve been waiting for you to post this after I saw the sneak peak on insta stories – cannot WAIT to make it 😍 Thank you! It was seriously SO GOOD. The coconut milk + the orange ice cubes = Some kind of awesome combination of frosty and creamy. Yum, I love those smoothies as well, I will have to give this a try! aren’t they amazing!? i was about to say “i have no idea how they make them taste so good” but then i remembered all that SUGAR. haha! really hope you like this version if you give it a try! This looks so delicious! I don’t think I’ve ever had an orange smoothie, but I need to try this for sure. THIS IS SUCH A GREAT IDEA! And so easy! I love orange smoothies – they remind me of dreamsicles (creamsicles?? I don’t remember). 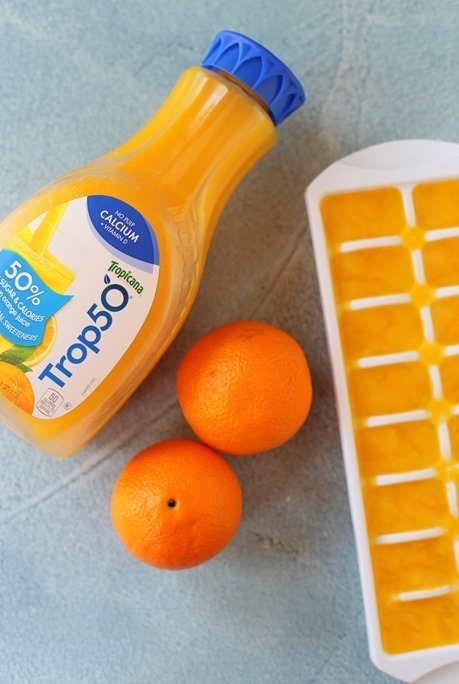 I love the idea of freezing the orange juice in an ice tray, genius!!! I screenshot the recipe you posted when you did your Easter recap this year. I wasn’t able to make it yet but now I can’t decide which one I should make, they both look delicious! I love those original orange smoothies so much but they have SO much sugar! The last time I made them, I was shocked at how you add powdered sugar to frozen OJ concentrate! Can’t wait to try out this healthier version! need to try this smoothie it looks refreshing! Monkey bread is just the best!! I’m already excited to have it on Christmas morning again this year! This looks so good! Definitely going to try this with my kiddos! They love drinks like this, but I love when we can make them with way less sugar! Mm this would have been perfect for beach days in the summer! I definitely think of hot toddys for the holidays and Fall. Making some this weekend! Oh man those are just too good! Yum I can’t wait to try this one! Thanks for sharing. Orange smoothies remind me of summer nights growing up! Oh my gosh…I feel like I need to go make this right now. We have snow on the ground….that means it is kind of like Christmas, right?? You have SNOW!?!? Amazing! The high here today is 80… send us some of your chill! This drink looks and sounds delicious–and I don’t even like oranges! (ate my sisters molded orange science project by mistake as a child…) My memories drinks would have to be a tie between Mexican hot cocoa (even better, in my opinion, with soy milk due to creaminess), which reminds me of winter days as a child, when my mom had enough time to stop for our favorite cranberry orange (this was before the infamous science project) muffins and hot cocoa before preschool and school. Second would have to be pumpkin smoothies from Jamba Juice, no explanation necessary. That sounds wonderful!!! And I too funny about your sister’s science project!! Haha! I’ve never been a big smoothie or milkshake drinker. This sounds so good & making it into popsicles is a great idea! Ahhh dreamsicle! It’s so interesting that you associate this with Christmas, but I like it! I associate homemade monkey bread with holiday mornings too. We ALWAYS have it. Also, my grandma made this snack mix with Quaker Oatmeal Squares that I still long for at every family gathering. I should write up a recipe post about it. There are two versions, one sweet and one salty, and both are called Granny’s Mix. 🙂 Memories. Please share this snack mix! Sounds great!! I’m wondering how to incorporate vanilla protein powder into this? Any ideas? I’d add a scoop of protein powder and just increase the liquid a bit! This takes me back to high school, the mall, and orange juilius! Same!!! The good ol’ dayssss. This looks so good, and I wish I could have it! I can’t have orange juice because of the acid but CAN have the terrible high sugar drinks in the mall because they are not remotely close to a real orange (although I can’t even remember the last year that I even had one). I will have to drool from afar! I’m glad this recipe exists, though, because I was a huge Orange Julius fan! Something that makes me think of the holidays: Trader Joe’s sparkling CHAMPAGNE grape juice (not just regular grape juice!) It’s so good, and we always have it around the holidays. Non-alcoholic of course. Ohhh! Trader Joe’s it a bit of a drive for me but that champagne grape juice sounds worth the trip! I’ve seen people do it with coffee before, so I figured why not orange juice!? I need to try this with more things! This is Waaay better than Orange Julius!!! I love orange smoothies! But, I just looked up “Trop50” ingredients out of curiosity, and it’s just water, orange juice, and stevia. Most of the product is water, and it is sweetened (albeit more “naturally” than, say, Diet Coke). I imagine you could just water down some oj, add a little stevia for increased sweetness, and save a bunch of money while saving the calories/sugar, as well. I mean, bravo to Tropicana for the marketing, but this was kind of a let down. Hi Julie! Can you taste the coconut in this recipe? My hubby hates coconut, so I was thinking of making it and simply not telling him what’s in it, but wanted to check if it indeed had a strong coconut flavor or not. You can taste it a bit. It’s not overpowering but if your husband hates coconut, it might be a deal-breaker. I’d just add more almond milk but the recipe will definitely be icier and not as creamy… or swap it for whole milk but then it obliviously won’t be dairy-free. Hope you guys love it if you decide to give it a try! This sounds so yummy I can’t wait to try it!! I have everything to make it except an orange 🤦🏼‍♀️ Can that be left out or should I wait to make it till I have the orange? Lol I just want to make sure it tastes as good as you say! Immediately thought of popsicles when I saw this, so I laughed when I saw the end of the post! Can’t wait to try it out!